MILWAUKEE — Dynamic offense jump-started the Milwaukee Bucks‘ season. Tighter defense has propelled them to the best record in the NBA. The Bucks are 15 games over .500, an impressive beginning for Mike Budenholzer’s tenure as Milwaukee’s head coach. Now comes the tough part: staying on top. True, there are no championships awarded in December. But the rest of the season looks promising. Antetokounmpo is having an MVP caliber season. He is averaging 26.6 points and 12.8 rebounds, while scoring on 66 percent of his two-point shots thanks to length and athleticism that makes him nearly unstoppable in the paint. He’s a gym rat and his work ethic is contagious. Antetokounmpo was drafted by the Bucks in the first round in 2013, which was also the year that Khris Middleton arrived from Detroit in a trade. The Bucks finished 15-67 in 2013, a franchise low point. Slowly but surely, they’ve been on the rise, with Antetokounmpo and Middleton at the core. 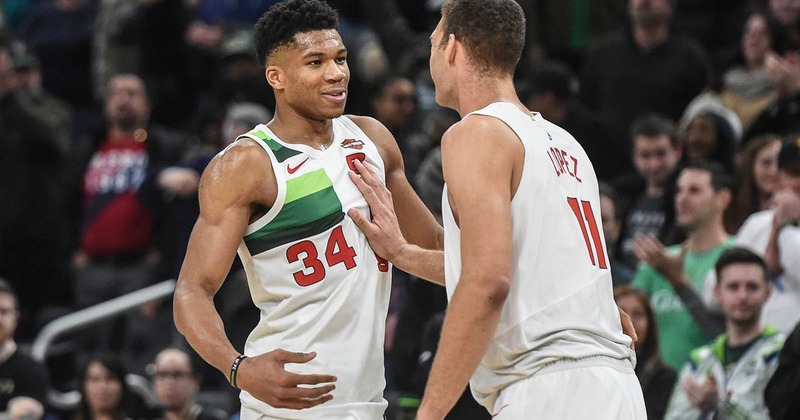 Milwaukee improved to 25-10 after a 14-point win on Saturday over the Brooklyn Nets, which gave the Bucks the best record in the NBA, percentage points ahead of Toronto. The Bucks are off to their best start since finishing 52-30 in the 2000-01 season. They’ve taken a major step forward this season with the arrival of Budenholzer. The former coach of the Atlanta Hawks has instituted a system that spreads the floor, while encouraging ball movement and smart 3-point shooting. It plays to Antetokounmpo’s strength of taking defenders off the dribble. Doubling Antetokounmpo leaves opponents at risk of leaving open shooters at the 3-point arc. The addition of Brook Lopez, a 7-foot center who can shoot 3s, gives defenses another matchup headache. “We really tried to pack the paint and they punished us with 3s. … It’s pick your poison,” Nets coach Kenny Atkinson said after the Bucks beat Brooklyn on Saturday behind a 21-of-51 effort (41 percent) from the 3-point line. Lopez was 7 of 15 from the arc, finishing with 24 points. Defense, though, was the focus in the December, when Milwaukee went 10-4. They averaged 111.0 points a game in the month, 10.1 less than the previous month. But the 104.6 points allowed in December were 8.5 less than November. Budenholzer, in part, credited his team’s adjustment to playing physical while limiting fouls. The Bucks have made the playoffs three out of the last four years, though they haven’t finished higher than the sixth seed. They’re learning to play as favorites, though Budenholzer doesn’t change his philosophy after the quick start. “I kind of have the same boring answer – it’s to come to work every day. The same approach … wherever we are in the standings,” Budenholzer said. But the coach knows how tough it is to play at a high level each night, and the challenge of getting it done in the playoffs. He led the Hawks to the No. 1 seed in the East in the 2014-15 season, but were swept by LeBron James and the Cleveland Cavaliers in the playoffs and didn’t reach the NBA Finals.